A Phi Beta Kappa from The Colorado College, Michael Nava went on to earn his law degree from Stanford University in 1981. From there, he worked with the Los Angeles City Attorney’s Office, a prestigious private appellate law firm, and then as a research attorney first with the California Court of Appeal and now with the California Supreme Court as a judicial staff attorney for Associate Justice Carlos Moreno. Nava also happens to be the author of nine books. While studying for the California Bar right out of law school, Nava started writing his first book which began his seven-volume mystery series featuring his openly gay protagonist, Henry Rios. His novels were published to great critical acclaim and include The Little Death, Goldenboy, How Town, The Hidden Law, The Death of Friends, The Burning Plain and Rag and Bone. The novels are discussed in a number of critical and scholarly works including Contemporary Gay Novelists, Emmanuel Nelson, ed. (Greenwood Press, 1993), and Brown Gumshoes: Detective Fiction and the Search for Chicano/a Identity, Ralph Rodriguez, ed. (University of Texas Press, 2005). Nava’s papers and manuscripts are housed at the UCLA Graduate Library Department of Special Collections. Nava is featured in Frederick Luis Aldama’s Spilling the Beans in Chicanolandia: Conversations with Writers and Artists (University of Texas Press, 2006). In the interview with Aldama, Nava notes that his first book “was rejected by fifteen publishers before it was picked up by this small gay publishing house, Alyson.” With the critical success of his book as well as changing attitudes toward gay-themed literature, Nava was eventually published by Penguin Putnam, HarperCollins and Ballantine. He also notes that “it’s wonderful that Latinos became the largest segment of the population in California; that betokens a demographic shift that will have very interesting consequences for the people living here.” Nava’s Wikipedia listing is here. Thousands of marchers – I heard people telling each other ten thousand – filled the streets of Seattle on Monday, April 10, from St. Mary’s church in the Central District to downtown Seattle, a distance of about three miles. Estimates the following morning put the number at twenty-five thousand people. 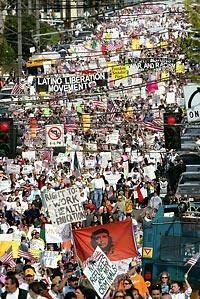 Banners ranged from “Columbus was illegal – and he has a holiday!” to “Refugees are not illegal” and “Latino Liberation Movement.” People sang, danced, and tried to chant slogans, but there were so many of us spread out across the city, that it was impossible to coordinate any chants. A woman dressed as the statue of liberty carried a placard that read “Bring me your tired and your poor….” Both the mayor of Seattle, Greg Nickels, and King County Executive Ron Sims addressed the crowd. To read Kathleen's entire report, go to her website. OPORTUNIDAD: The Getty Foundation has awarded a grant to fund the UCLA Chicano Studies Research Center Summer Internship. Responsibilities include a number of related duties for two CSRC projects: a new book series on Latina/o artists; and a forthcoming museum exhibition on Chicana/o artists. For both projects, the intern will assist in compiling artist biographies and selected bibliographies, corresponding with artists about checklists, collecting images for each artist, and researching the credit information for images. The intern will receive training in book and catalogue production and will acquire hands-on experience in working with curators, artists, editors, and printers. The intern will work among an established CSRC arts team that includes two curators and four graduate student researchers; and he or she will have dedicated assigned space and equipment. Please address inquiries to Carlos Manuel Haro, Assistant Director at csrcinfo@chicano.ucla.edu. HUMMING ALONG: Sunday, the El Paso Times ran a nice article on Luis Alberto Urrea regarding the paperback release of his magnificent novel, The Hummingbird’s Daughter (Little, Brown). UP CLOSE AND PERSONAL: Mario Acevedo, author of The Nymphos of Rocky Flats (HarperCollins/Rayo), will be reading and signing his book at Borders Books on Thursday, April 27, 7:00 p.m., 8852 Washington Blvd., Pico Rivera, CA 90660. Phone: 562-942-9919. Nava, when he was actively publishing, numbered among my favorite mystery writers. As his stories developed, though, he became less a chicano novelist than "merely" a novelist whose character happened to be chicano. The gay element figured more prominently in his plots than the chicas patas. Unless the character's intolerant father somehow represents a "chicano" link? I'd recommend Nava's stuff on the basis of being good mysteries, not because they are "gay" or "chicano". So, what's Michael Nava up to these days? Has Nava lost that, as Manuel said in his The Docket interview, "need to love it"? You So. Calif. Bloguistas (and others) are in for a fragaso of a treat if you can attend Mario Acevedo's booksigning; the vato's entertaining. Even tho we bought him un trago after his Denver premier, one of those Santa Ana winds may make him thirst for another. I know you'll treat him like we would if we were there.